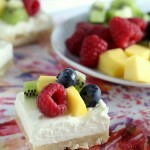 Layered No Bake Cheesecake - Dessert Now, Dinner Later! 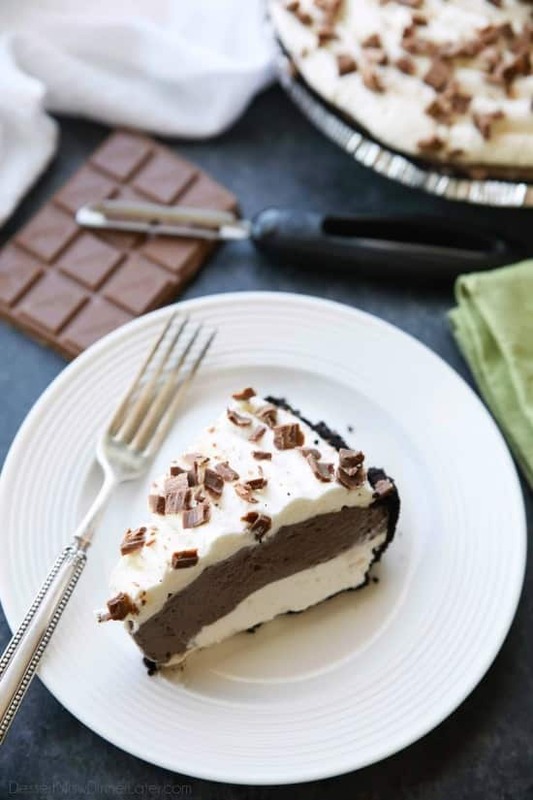 This no bake cheesecake has two layers of light and smooth cheesecake — creamy vanilla and decadent chocolate, layered inside a chocolate cookie crust, and topped with sweetened whipped cream and chocolate shavings. 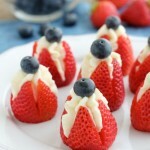 It’s an easy and delicious summer dessert! I’m deeming this the summer of no-bake desserts and this layered no bake cheesecake is definitely a favorite. It’s so smooth, light, and creamy! 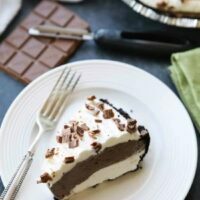 My husband was extremely impressed with how light and fluffy this layered no bake cheesecake is. That can be potentially dangerous though — you may want to eat the whole thing. Haha. 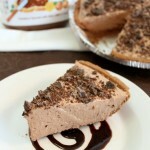 It reminds me a lot of an Edward’s Hershey Pie, but it’s obviously fresher and so easy to make! 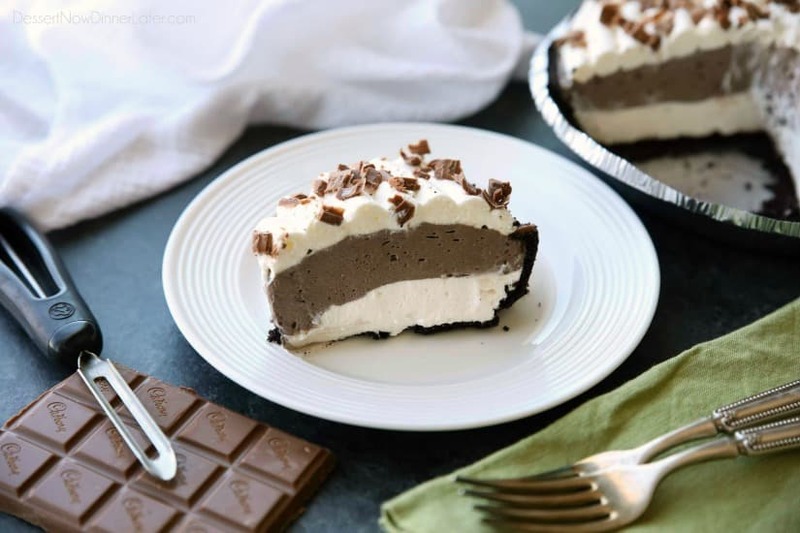 You use a store-bought crust, then make one batch of no bake cheesecake, split it in half and add a few more ingredients for the chocolate layer. 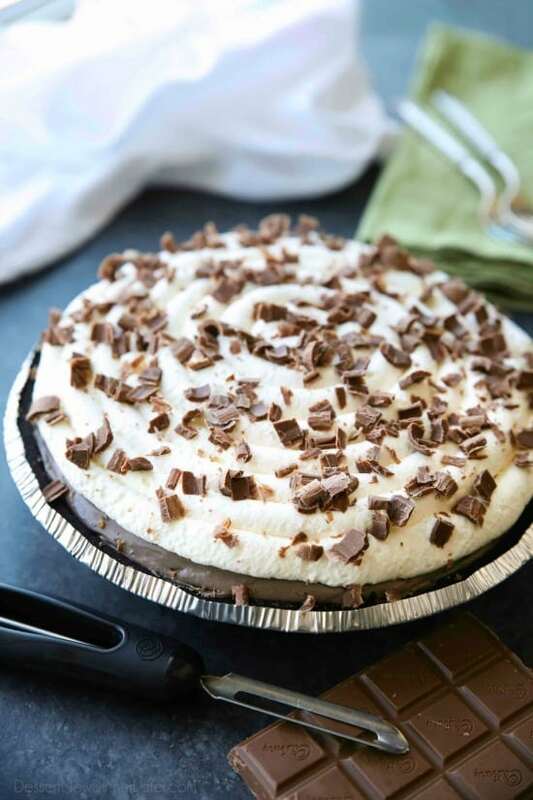 Then you whip up some sweetened whipped cream and shave some chocolate over the top for decoration. Voila! Dessert perfection! Refrigerate for a few hours for clean slices. I may have been a little impatient in wanting to photograph this one. It sets even better than pictured. 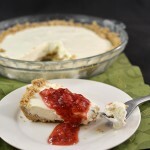 This no bake cheesecake is one the whole family will gobble up super fast! You’re going to love it! Enjoy my friends! In a large bowl with an electric hand mixer, beat the cream cheese and granulated sugar until smooth. Add the sour cream and vanilla. Beat again. Add the whipped topping and mix until combined. Pour half of the cheesecake filling into the bottom of a prepared chocolate crust. Add cocoa powder and powdered sugar to the remaining cheesecake filling. Beat with hand mixer until combined. Spread evenly over the vanilla cheesecake layer. In the bowl of a stand mixer fitted with the whisk attachment, beat the heavy cream and powdered sugar until stiff peaks. 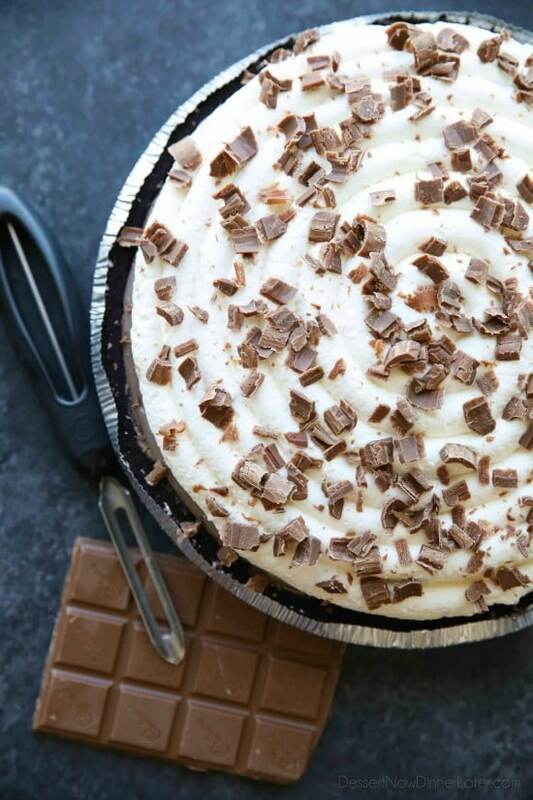 Spread or pipe whipped cream onto the top of the chocolate cheesecake layer. 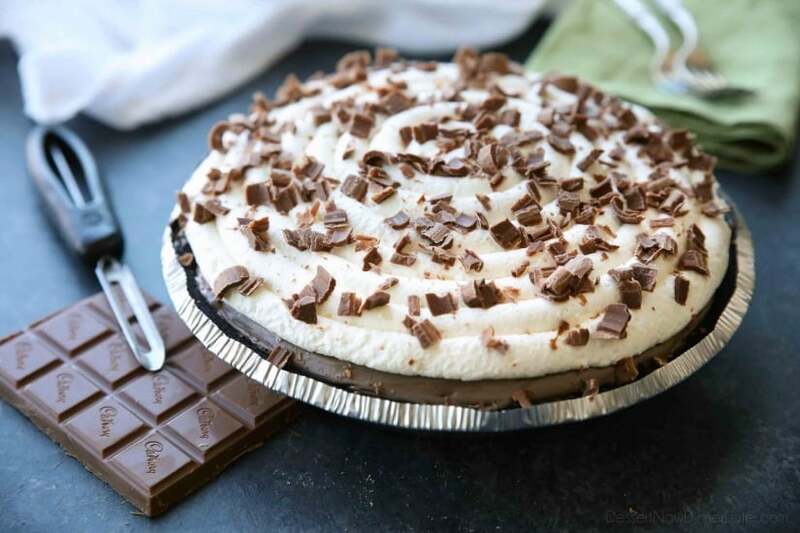 Use a vegetable peeler to cut chocolate shavings from a candy bar over the top of the whipped cream layer. REFRIGERATE 4-6 hours or overnight to set completely. Wow! That’s a huge coincidence! I’m more in tune with food than I though! Haha. Thanks Kent! Think I could use greek yogurt instead of sour cream? !